I have been here in the US for almost 2 days now. Things are going smoothly, and it is wonderful to see everyone. I loved being at church and seeing so many friends and the night before catching up with many people at Carrie Kimmel's wedding! 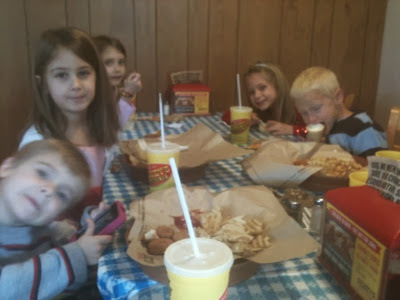 We were even able to go to Dickey's with some friends for kid's eat free Sunday at Ezra's request. He couldn't put the ice cream down for a photo; it was too good! All of this feels in some ways like coming home, but I am also really missing my family, friends, students, and the children of GSF. I just saw a video about GSF posted on Facebook and it made me feel homesick for my Uganda home. The adorable toddlers in the video are my next door neighbors. Here is a link to the video. Post by Good Shepherd's Fold Orphanage. It is only 3 minutes and definitely worth watching! I am also missing the weather! It has been cold, rainy and gray here in Georgia, while it is warm and everything is green in Uganda. But as they say, "The grass is always greener on the other side of the fence (or ocean in this case.)" I guess wherever you are it is easy to always wish you were somewhere else. It is easy to see the things that I wish were different. But I am not going to list those today. Instead I am going to remember to be thankful. Therefore be imitators of God, as beloved children. 2 And walk in love, as Christ loved us and gave himself up for us, a fragrant offering and sacrifice to God.3 But sexual immorality and all impurity or covetousness must not even be named among you, as is proper among saints. 4 Let there be no filthiness nor foolish talk nor crude joking, which are out of place, but instead let there be thanksgiving. 5 For you may be sure of this, that everyone who is sexually immoral or impure, or who is covetous (that is, an idolater), has no inheritance in the kingdom of Christ and God. 6 Let no one deceive you with empty words, for because of these thingsthe wrath of God comes upon the sons of disobedience. 7 Therefore do not become partners with them; 8 for at one time you were darkness, but now you are light in the Lord. Walk as children of light9 (for the fruit of light is found in all that is good and right and true), 10 and try to discern what is pleasing to the Lord. 11 Take no part in the unfruitful works of darkness, but instead expose them.12 For it is shameful even to speak of the things that they do in secret. 13 But when anything is exposed by the light, it becomes visible, 14 for anything that becomes visible is light. Therefore it says,“Awake, O sleeper, and arise from the dead,and Christ will shine on you.”15 Look carefully then how you walk, not as unwise but as wise, 16 making the best use of the time, because the days are evil. 17 Therefore do not be foolish, but understand what the will of the Lord is.18 And do not get drunk with wine, for that is debauchery, but be filled with the Spirit, 19 addressing one another in psalms and hymns and spiritual songs, singing and making melody to the Lord with your heart, 20 giving thanks always and for everything to God the Father in the name of our Lord Jesus Christ, 21 submitting to one another out of reverence for Christ. One of the points we discussed is the importance of thanksgiving. At the end of the class we spent a bit of time actually giving thanks. Thanking God helps me focus on his grace and love for me, rather than what I think I lack. I have much for which to be thankful! Here is a quick list of 10 things off the top of my head that I am thankful for today. Eternal life and forgiveness through Jesus Christ! An opportunity to see family and friends whom I have missed for 6 months. People all over the world praying for me and my family this month. A super supportive sending church here, where dozens of people have asked how they can help. A loving husband who is caring for my other 3 children in Uganda. Good friends in Uganda who are helping David care for my kids. The opportunity to be a part of the work at Good Shepherd's Fold. Friends who have shared warm clothes with me for this month. I would like to encourage you to make your own list. It always helps my perspective when I take the time to thank God for things. What are you thanking God for today?